Товарен самолет Ил-76, произведен 1978 г. с регистрационен номер EK-76300 и собственост на конгоанската авиокомпания Aеro-Service катастрофира при кацане в условия на буря на летище Мая-Мая на столицата Бразавил. Самолетът излязъл от пистата, помел близките жилищни постройки и се разбил обхванат в пламъци. Загиналите са 32, в това число шест-членният екипаж от арменци и украинци и пътник. Ранени са 14 души. Транспортный самолет Ил-76 (EK-76300), принадлежавший авиакомпании Aero-Service, разбился вследствие непогоды в столичном аэропорту в Республике Конго. По предварительным данным, самолет, перевозивший автомобили и другие товары, из-за сильного ветра не смог приземлиться на взлетно-посадочной полосе аэропорта Браззавиля и рухнул на расположенное неподалеку поселение, разрушив несколько строений. В результате крушения и последующего пожара погибли 32 человека, получили ранения 14. Aero-Service IL-76 cargo plane (EK-76300) overshot runway 23R of Brazzaville-Maya Maya Airport (BZV) on landing in thunderstorm, crashed and caught fire. All 6 crew-members and 26 people in the nearby houses were killed, 14 were injured. Among those perished are the Armenians - Varazdat Balasanyan, crew commander, born 1949; Ara Tovmasyan; Tadevos Hovannisian, Andranik Gevorgyan; Edgar Avetyan, born 1989. An investigation is under way. 01.11.2012*/Dominican Republic/ about half a mile from La Isabela International Airport (MDJB) - A Grumman American AA-5 Traveler plane (HI-389) made an emergency landing shortly after take-off, damaged. No injuries. */Brazil/ MT/ Chapada dos Guimaraes - An Embraer EMB-810D Seneca III (PA-34) plane (PT-VRV) crashed killing the 4 occuapnts. 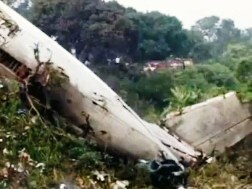 03.11.2012*/Brazil/ SC/ Camboriu - An Inpaer Excel plane crashed into the sea killing 2 people on board and injuring 11-year-old boy. */US/ TX/ Roanoke-Northwest Regional Airport - A Cessna 172S Skyhawk SP plane (N985GE) hit the top portion of a Volvo SUV that was traveling on a perimeter road. The aircraft lost its landing gear and crashed on the runway. The pilot of the plane was not injured. The two people in the car were taken to hospital with non life threatening injuries. */UK/ North Yorkshire/ near Sherburn-in-Elmet Airfield (EGCJ) - A Piper PA-28RT-201T Turbo Arrow IV plane (G-BNTC) crash-landed on a small hill at the airfield perimeter on approach. */Italy/ Milan Bresso (LIMB) - A training Robinson R22 Beta II helicopter crashed on landing. 04.11.2012*/US/ LA/ Lafayette/ Lafayette Regional Airport (KLFT) - An Waco SRE Aristocrat (N247E) crashed on approach. No injuries. */Syria/ Deir el-Zour province/ near the Al-Ward oilfield - A MiG-23 Flogger jet shot down by rebels. The fate of the pilot is unknown. 06.11.2012*/Australia/ QLD/ Beaudesert - A Cessna-172N plane (VH-JGR) crashed injuring the pilot. */US/ KS/ Wichita Mid-Continent Airport - Baron Aviation Cessna 208B Super Cargomaster plane (N793FE), leased from FedEx, crashed shortly after takeoff killing the pilot. */US/ CA/ Patterson - A Cessna 172M Skyhawk plane (N21391) made an emergency landing in a field, but rest upside down. No injuries. */South Africa/ Mthatha Airport - A military Douglas C-47 Dakota plane with 16 occupants crashed on landing. No injuries. 07.11.2012*/Sudan/ South Kordofan/ Jau - Sudanese Air Force Antonov An-24RV bomber had been shot down by insurgents from the Sudan People's Liberation Movement North (SPLM-N). The plane crashed in flames. The alleged victims are at least 2. */Malaysia/ Sarawak/ Mauradi/ Marudi Airport (WBGM) - MAS Wings DHC-6 Twin Otter plane (9M-MDO) skidded almost 40 meters after landing on runway 10 at Marudi Airport, into a drain near the runway. The aircraft received damage to its undercarriage and both propellers and its left wing. A 26-year-old woman was slightly injured. 08.11.2012*/New Zealand/ Central Otago/ between Wanaka and Queenstown - A Robinson R22 Beta helicopter crashed killing the pilot - Julianne Kramer. */Finland/ 2 km from EFJO/ near Kontiolahti/ Puntarikoski - A Cessna 206H Stationair plane (OH-AAA) crashed killing the pilot. */Peru/ Paracas/ at kilometer 19 of the highway Pisco-Paracas - Peruvian Air Force (FAP) Aermacchi MB339AP training plane crashed. Both pilots ejected. 09.11.2012*/South Africa/ Limpopo/ between Mokopane and Polokwane - A training Cessna 172R Skyhawk plane (ZS-SPI) crashed into the Ysterberg mountain range killing the 2 occupants. */US/ MN/ Minneapolis/ Minneapolis-St. Paul International Airport (KMSP) - A Fairchild Swearingen SA-227 Metro III cargo plane (N619BA), belonged to Bemidji Aviation Services Inc., collapsed the left landing gear on landing and veered off a runway. No injuries. */France/ W of Saint-Germain-du-Teil/ Lozere - an Algerian military cargo plane CASA C-295 (7T-WGF) went down around 4 p.m. in Trelans, a town 375 miles (605 kilometers) south of Paris. The plane was carrying a cargo of banknote paper for the Bank of Algeria. All 6 occupants died in the crash. 10.11.2012*/US/ LA/ Acadia Parish/ near Crowley - A Rans S-19 Venterra plane (N434KL) crashed on landing injuring the pilot. A Turkish military helicopter, Sikorsky S-70A Black Hawk (10992), crashed Saturday in the southeastern city of Siirt, killing all 17 troops on board, local officials said. An investigation was ongoing to determine why the Sikorsky chopper went down. The helicopter might have hit a hill or a rock outcropping due to stormy weather in the area. 11.11.2012*/Brazil/ SP/ Sao Paulo-Congonhas Airport (CGH) - Tropic Air Taxi Aereo Cessna 525B CitationJet CJ3 plane (PR-MRG) sustained substantial damage in a runway excursion accident. The captain suffered serious injuries while the copilot and passenger suffered minor injuries. */US/ AK/ Akiachak - A Piper Super Cub crashed injuring the pilot. */Italy/ Palermo-Punta Raisi Airport (PMO/LICJ) - A parked Apex DR.400-140B plane (F-HBFO) was blown onto its back by strong winds. */Italy/ Rome Fiumicino airport - The TAP Air Portugal Airbus A320-214 plane (CS-TNL) had arrived and passengers had already disembarked, when a bagage handler got sequeezed between the belt loader and the rear cargo door. The bagage handler died and the aircraft sustained severe damage. */US/ AZ/ west of Maricopa - A Cessna 172P Skyhawk plane (N65835) crashed shortly after takeoff injuring seriously the pilot. */South Africa/ Port Elizabeth/ Bluewater Beach - A Sling-2 plane (ZU-FUS) made an emergency landing on a beach and was damaged. */US/ GA/ near Jasper/ Old Philadelphia Road - A Cessna 210 Centurion plane (N9633T) experienced a loss of engine power and force landed on a road, sustaining substantial damage. No injuries. 13.11.2012*/Canada/ BC/ Trail Regional Airport (CYYZ) - Pacific Coastal Airlines Saab-340 jet (C-GPCN) suffered damage to the right hand engine when a fire erupted on landing. No injuries. 14.11.2012*/Canada/ west of Ottawa/ North Gower - A Cessna 140 plane (CF-CFR) flipped upon landing. The pilot recieved minor injuries. */US/ IN/ Indianapolis Regional Airport (KMQJ) - A Beechcraft M35 Bonanza plane (N9743R) collapsed the nose gear on landing. No injuries. */Venezuela/ Lara/ Valle del Turbio de Barquisimeto - A Piper PA-28R-180 Cherokee Arrow plane (YV2261) landed gear up in an empty terrain close to the airport. */South Sudan/ Yida - Ultimate air ltd Antonov 26 plane (3X-GFN) went off the runway on landing in Yida and came to a stop with the left main gear collapsed. 15.11.2012*/US/ NY/ Elmira/ Corning - A Hughes 369D helicopter (N369AW) was inspecting power lines, when it hit some lines and crashed killing the 2 occupants. */South Sudan/ Aweil Airport - Skyward International Aviation Fokker 50 plane sustained substantial damage in a landing accident. The aircraft ran off the runway and its left hand wing separated from the fuselage. */US/ FL/ Tyndal AFB east of Panama City - A Lockheed Martin F-22A Raptor fighter jet crashed in a wooded area. The pilot ejected. */South Korea/ a mountain in Hoengseong - A KAI T-50B Golden Eagle military jet crashed killing the pilot. The plane is a trainer jet flown by the South Korean Air Force Black Eagles aerobatic team. */US/ CA/ Palm Springs/ Palm Springs International Airport (KPSP) - A Stolp SA-300 Starduster Too plane (N45JV) collapsed a landing gear on landing. 16.11.2012*/Paraguay/ Chaco Boreal - A Beechcraft B55 Baron Colemill plane (ZP-BLV) ran out of fuel and crashed killing all 3 people on board. */Sweden/ Skavsta (ESKN) - A Cessna 172N Skyhawk II plane (SE-KHX) crashed on approach killing the pilot. */US/ NY/ White Plains/ near Westchester County Airport (KHPN) - A Beechcraft 35-B33 Debonair plane (N8519M) collided with some trees and crash-landed in a parking lot. The pilot suffered moderate injuries. */US/ GA/ Rome/ Richard B Russell Airport (KRMG) - A Beech P35 Bonanza plane (N8589M) landed with retracted gears during touch-and-go maneuvers. */US/ AZ/ NE of Pinetop/ Sitgreaves National Forest - A Cirrus SR22 G2 plane (N800RW) suffered an oil failure during the flight. The pilot used the emergency parachute system of the aircraft. After the pilot was taken away for medical evaluation, the parachute reinflated and the aircraft flipped on its back. The pilot suffered minor injuries. */Slovakia/ Bratislava M.R. Stefanik airport (LZIB) - Air Contractors / DHL cargo Airbus A300B4-203/F plane (EI-EAC) collapsed the nose gear on landing. 17.11.2012*/Russia/ Omsk Oblast/ Sedelnikowo - UTair Mi-8T helicopter (RA-22343) performing flight УТА-9232 with 17 passengers and 3 crew members crashed on landing due to a strong gust of wind. Four occupants received moderate injuries. */US/ NY/ Rye Brook/ less than a mile south of New York's Westchester County Airport - A small plane, manufactured in 1963, crash-landed injuring the pilot. */US/ SC/ Greenwood County Airport (GRD) - A Cessna 550 Citation II corporate jet (N6763L) was destroyed in a runway collision with a deer. Both occupants escaped uninjured. The deer was killed. */Canada/ QC/ 80 km northeast of Ottawa - A helicopter crashed into a lake injuring slightly the pilot. */Thailand/ Pattaya Port - A P&M Quik GT450 microlight aircraft collided with the pier of a new bridge at Bali Hai after an engine failure. The aircraft sank and both occupants were rushed to a hospital, where the pilot died. */US/ CA/ Yucca Lane helipad - While one police helicopter tookoff and another one landed, the rotors of both helicopters caught into each others. The helicopters collided, crashed and were substantially damaged. Six people received minor injuries, including the pilots. The helicopters involved in the accident were Bell OH-58 Kiowa (N911FA) and Bell OH-58A Kiowa (N96BM). */US/ WY/ 15 mls from Bondurant - A Cessna 182D Skylane plane crashed killing the pilot. 18.11.2012*/US/ GA/ Savannah - A 1968 Cessna 172 plane (N78304) crashed in a marsh killing the pilot. */Canada/ MB/ 2 km (1.3 mls) E of Snow Lake Airport - Gogal Air Service Cessna 208B Grand Caravan plane (C-GAGP) crashed shortly after takeoff killing the pilot and injuring the 7 passengers. */Northern Mariana Island, Saipan Airport - A Piper PA 32-300 plane (N4267R) crashed on takeoff killing 1 occupant, injuring seriously 6. */Germany/ Biberach an der Ris Airport (EDMB) - A Tecnam P2006T plane (D-GTDI) crashed on approach killing the pilot. */Russia/ Krasnodar Krai/ Belorechensky District - A X-32 Bekas microlight aircraft (RA-0502G) crashed in a field killing the 2 occupants. 19.11.2012*/Atlantic Ocean/ between Havana-Milan - Neos Boeing 767-306ER (I-NDMJ) encountered severe clear air turbulence over the Atlantic, causing an altitude deviation of 1000 feet (300 meters). Lunch was being served and all loose objects, unfastened passengers and flight attendants were dislodged from their location, hitting the ceiling. After landing 66 people required medical assistance. */Colombia/ San Francisco - A Cessna plane crashed. The fate of the pilot is still unknown. 20.11.2012*/US/ VA/ Roanoke Regional Airport (KROA) - A Beechcraft C90A King Air plane (N702DK) collapsed the landing gear on landing. No injuries. */US/ IA/ Red Oak Municipal Airport (KRDK) - A 1965 fixed wing single-engine Cessna 150 F plane (N8000S) came off the runway during landing and entered a bean field, where the front landing gear collapsed. No injuries. */US/ CA/ near San Rafael Airport (CA35) - A Cessna 210D Centurion (N3919Y) made a force landing shortly after takeoff injuring slightly the pilot. */US/ TX/ San Antonio/ Horizon Airport (74R) - A Boeing A75L3 Stearman plane (N56226) crashed on takeoff into trees and a fence. No injuries. 21.11.2012*/Australia/ 10km south of Gilgandra - A Cirrus SR22 GTS G3 Turbo plane (VH-WYH) lost engine power and pilot decided to deploy the plane's ballistic parachute (CAPS). The plane crashed into a paddock. Both occupants had to be treated in hospital for minor injuries. */US/ CO/ Denver/ Front Range Airport (KFTG) - A RAF SE5A Replica plane (N17SE) crashed on landing killing a retired British pilot. */US/ MI/ Hillsdale County/ Adams Township - A Piper PA-28-180 Archer plane (N40781) crashed into a house killing the pilot. */Russia/ Sakha/ Deputatskiy Airport - Polyarnye Avialinii Antonov 26B-100 passenger plane (RA-26061) sustained substantial damage in a runway excursion accident. The nose undercarriage collapsed and the right hand twisted forward, causing the nr. 2 engine to touch the ground. */US/ MA/ Hyannus - Cape Air Cessna 402-C suffered a bird strike en-route to Nantucket. The bird strike broke in the copilots windshield causing minor injuries to him. 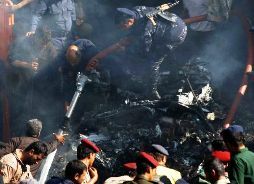 A military Antonov 26 plane crashed in the Yemeni capital on Wednesday, killing all 10 occupants, the country's defense ministry said. The plane tried to make an emergency landing after its engine failed, but the plane crashed near a public market in the Al-Hasaba area of Sanaa. The defense ministry said passengers were on a pilot training mission, with the head pilot instructing trainees from the government's armed forces. 22.11.2012*/Venezuela/ near Maracay-El Libertador AB (MYC/SVBL) - One pilot has died and 3 were injured when two Venezuelan military attack Bronco O-V planes collided midair. The planes were performing exercises ahead of the air force’s anniversary celebrations. */Germany/ Helgoland - A Piper PA-28R-200 Cherokee Arrow plane crashed on takeoff. No injuries. */Mexico/ Mexico City/ Valle de las Monjas - A Cessna-170 plane crashed killing 1, injuring 1. */Bahamas/ North Abaco/ Great Guana Cay - A helicopter crashed on landing due to a strong gust of wind. One was killed and 3 others seriously injured. */Pakistan/ Hussnainabad/ Kot Shakir - PAF Mirage 5 fighter jet crashed killing the pilot. 23.11.2012*/US/ AZ/ Yuma - A Piper PA-28 plane crashed killing the female pilot. 24.11.2012*/US/ WI/ Brodhead/ Brodhead Airport (C37) - An Aeronca 65-CA Chief plane (N34585) crashed on landing. No injuries. */Syria/ Marj al-Sultan - A Syrian Air Force combat helicopter shot down by rebels. */Syria/ Marj Al-Sultan Air Base - Two Syrian Air Force Mi-17 parked helicopters destroyed by rebels. */Kazakhstan/ Almaty Province - Euro-Asia Air Mi-8 helicopter (823) crashed killing all 8 people on board. */Venezuela/ San Jose de Guanipa - A Bell 206 JetRanger helicopter (YV2527) rolled over during autorotation forced landing. The 4 occupants received minor injuries. 26.11.2012*/US/ UT/ Fillmore - A Piper PA-28 plane crashed killing the 3 occupants. */US/ LA/ south of Deridder - A Beech S35 Bonanza plane (N322D) crashed during a forced landing. The pilot sustained serious injuries. */South Africa/ Gauteng/ Midrand/ Glen Austin - A Piper PA-31-350 plane (ZS-JHN) crashed on landing and caught fire. No injuries. 27.11.2012*/US/ OR/ outside of Sheridan/ on top of Cherry Hill - A Hughes 369D helicopter (N163PJ) crashed into a truck injuring the pilot. */Venezuela/ near Maracay-El Libertador AB (MYC/SVBL) - A Hongdu K-8 Karakorum single-engine, advanced jet trainer and light attack aircraft, crashed during a military parade. Both pilots ejected safely. */Venezuela/ Aragua/ near Libertador AB - A military Eurocopter AS 532UL Cougar helicopter crashed during rescue operation for pilots of crashed K-8 jet. */Syria/ near Aleppo - Syrian Air Force Mi-17 helicopter shot down by rebels. */Comoros/ N off Moroni-Prince Said Ibrahim In Airport (HAH) - Inter Iles Air Embraer 120ER Brasilia passenger plane (D6-HUA) crashed into the sea shortly after takeoff. All 25 passengers and four crew members were rescued. The airplane operated on a domestic flight to Anjouan-Ouani Airport (AJN). A survivor reported that the pilot was attempting to return to the Moroni airport. He also reported observing a possible fuel leak on takeoff. 28.11.2012*/US/ IA/ Clutier/ Traer - A Taylorcraft BC12-D plane (N94973) crashed killing the pilot, injuring seriously the piassenger. */US/ FL/ Merritt Island - A Comp Air CA-8 plane (N155JD) crashed on approach injuring seriously both occupants. */Indonesia/ East Kalimantan/ over the waters of Balikpapan Bay - A helicopter flew very low over a speedboat carrying eight passengers. One passenger was hit by the helicopter and died from the injuries sustained in the incident. 29.11.2012*/Brazil/ Ponta da Fruta/ Espirito Santo/ Vila Velha - An ultralight Flopes plane (PU-ZFL) made an emergency landing but crashed killing the pilot. */US/ NE/ Blair - An Ercoupe 415-C plane (N720RC) crashed into a hill killing the pilot. */US/ CO/ Gold Hill - A Schweitzer SGS 2-32 glider (N9929J) crashed on landing after experiencing downdrafts. The pilot was seriously injured and the passenger received minor injuries. */US/ OK/ 30 miles east of Guymon/ 12 miles east of Hardesty - A Cessna 208B Grand Caravan (N1324G) made an emergency landing. The pilot received minor injuries. 30.11.2012*/US/ FL/ Tampa/ the bay off Apollo Beach - A Robinson R-22 helicopter crashed killing the pilot. */Indonesia/ Tangerang/ Pondok Cabe airbase - Indonesian Air Force Enstrom 480B Guardian helicopter crashed on landing injuring the 2 pilots. */Germany/ near Marl-Loemuhle (EDLM) - A TL-3000 Sirius plane (D-MWT) crashed on approach injuring seriously the 2 occupants.